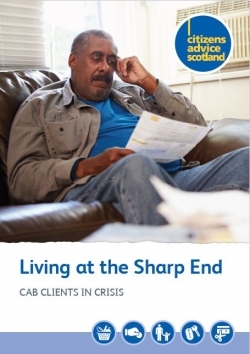 The new CAS report, ‘Living at the Sharp End’, is based on Scottish CAB evidence over the last four years, as well as a survey of CAB clients and special focus groups of those who are living in severe poverty. It finds that the social security system is failing to provide the essential safety net that is meant to stop people falling into poverty. CAB clients needing advice about foodbanks in Scotland are younger than the average CAB client. While the majority are single adults without children, almost one third have children and 12% are single parents. One in ten are homeless. And more than one third are unable to work due to ill health or disability. Almost two thirds of our survey respondents (63%) said they sometimes cut down on gas and electricity and 71% said they sometimes cut down on food. “There have been many different studies over the last few years showing that poverty levels are rising in Scotland. Our concern is that, as a society, we are in danger of becoming used to these reports, and that we are beginning to accept it as the norm. CAS believes that Scotland should never fall into that trap, and that extreme poverty has no place in our society. “When reports like this have been published in the past, the standard government reaction has been to say that there is a support network in place that prevents people falling into destitution. Our evidence today shows beyond dispute that this is simply not the case., If it were, there would be no need for foodbanks at all, yet Scottish CABs had to give foodbank advice 7,400 times last year. For more information, interviews etc. please contact Tony Hutson on 07774 751655.